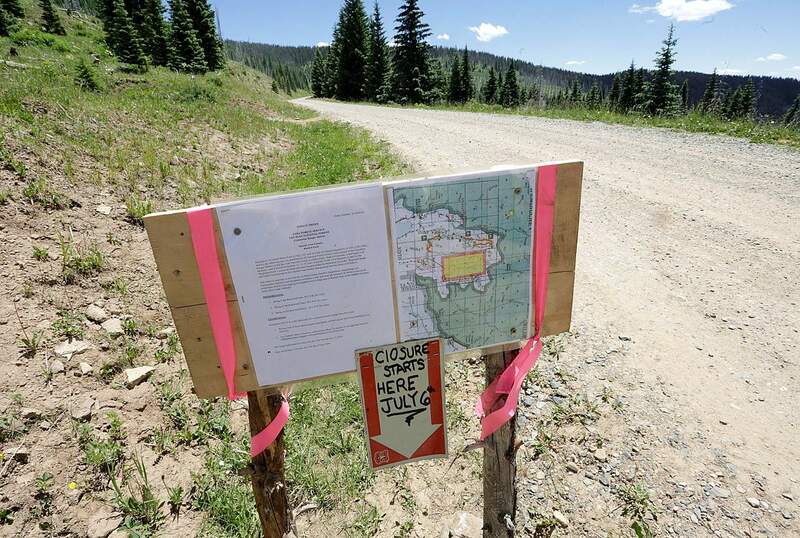 Search teams spent five days combing the Middle Mountain area in July 2016 to look for items that might be associated with Dylan Redwine’s death. Searchers found items of interest in this same area the teen’s partial remains were found in 2013. Mark Redwine was arrested Saturday in Bellingham, Wash., in connection with his son Dylan’s death. Redwine faces charges of second-degree murder and child abuse resulting in death. He will have a hearing Monday in Whatcom County court. If he waives extradition, he will be transported to La Plata County jail, and the case will be prosecuted in the 6th Judicial District. 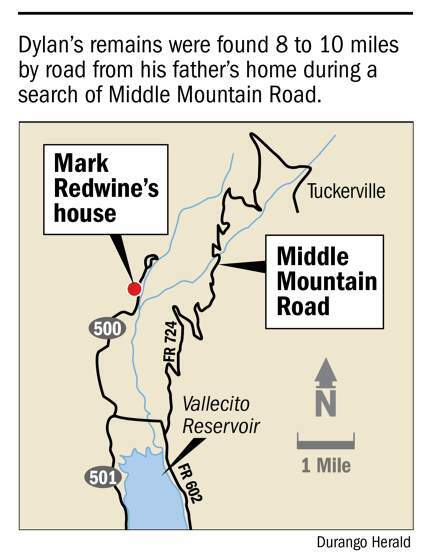 Mark Redwine’s house just north of Vallecito Reservoir was the last place his son Dylan was seen in November 2012. Redwine said he left his house the morning of Nov. 19, 2012 and when he returned later that day, Dylan was missing. The teenager’s remains were later found in 2013 and 2015. A grand jury has indicted Redwine for his son’s death. 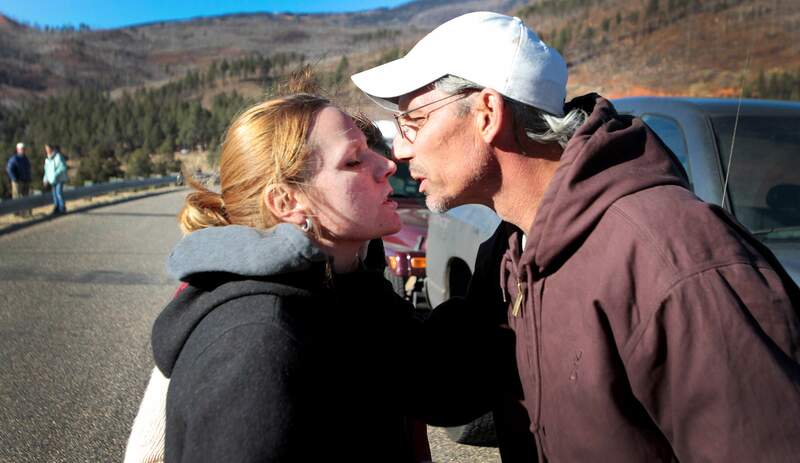 Elaine Hall shares a moment with now-husband, Mike Hall, on the dam at Vallecito Reservoir on Nov. 26, 2012, during the eighth day of the search for her 13-year-old son Dylan Redwine. Dylan was last seen at his father’s home north of the reservoir on Nov. 19, 2012. A dive team from New Mexico State Patrol spent the day scanning the bottom of the reservoir with sonar. 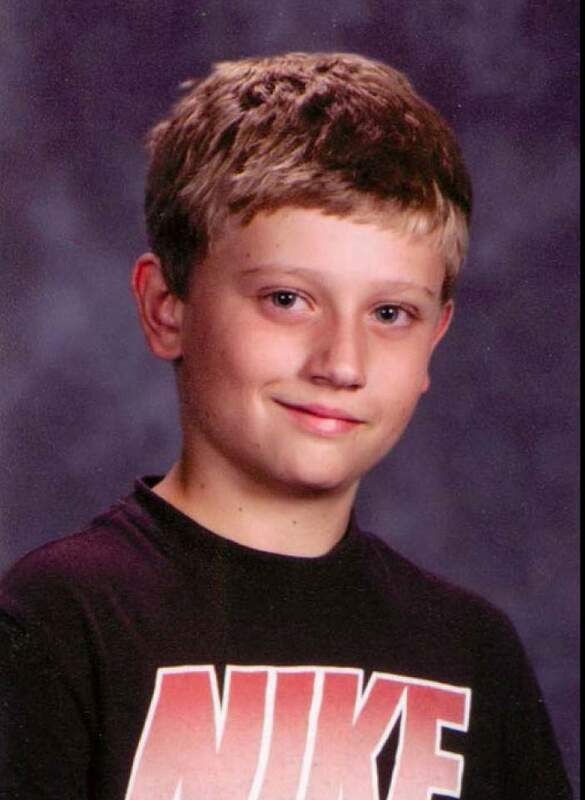 Dylan Redwine was 13 when he was reported missing on Nov. 19, 2012. He was last seen at his father’s house, where he was visiting after a court ordered the visitation. The teenager’s remains were later found in 2013 and 2015. A grand jury has indicted Mark Redwine for his son’s death. Mark Redwine, the father of Dylan Redwine, was arrested Saturday in Bellingham, Washington, after a grand jury indictment in connection with his son’s 2012 death. He is being held on a $1 million cash-only bail in Whatcom County. He faces charges of second-degree murder and child abuse. Dylan Redwine was 13 when he disappeared from his father’s home November 2012 in Vallecito. His partial remains were found in June 2013 on Middle Mountain. His death was ruled a homicide. Mark Redwine was named a person of interest in the death, but he had not been charged previously. He has maintained his innocence during the past 4½ years. Efforts to reach Durango lawyer Christian Hatfield, who has represented Mark Redwine in past legal matters, were unsuccessful Saturday. A La Plata County grand jury was impaneled July 17 and returned indictments Thursday, finding probable cause to charge Redwine in connection with his son’s death. He is expected to face extradition proceedings in Washington before being brought to Durango, where he will be advised of the charges. To be found guilty of second-degree murder, prosecutors must prove a person knowingly caused the death of another person. Dylan’s blood was found in his father’s living room.A cadaver dog detected a deceased person had been in the living room and in the bed of Redwine’s pickup.Dylan’s skull was found in November 2015 just off Middle Mountain Road and had what appeared to be knife markings.The skull appears to have been moved from a previous location, where earlier remains were found.The La Plata County Sheriff’s Office and 6th Judicial District Attorney’s Office will hold a news conference at 2:30 p.m. Tuesday at the county’s Administration Building, 1101 East Second Ave., to provide additional details and answer questions. Hall said she isn’t surprised by the details contained in the indictment, but they have never been put together so clearly. She declined to speculate about what Redwine might be thinking or feeling in jail. Redwine’s arrest is the end of one chapter but the beginning of what is expected to be a long judicial process. A fraught father-son relationshipRedwine was last seen alive on Nov. 18, 2012, when he arrived by airplane for a court-ordered visit to see his father. He arrived from Colorado Springs, where he was living with his mother. After his arrival, the father and son stopped at Walmart and McDonald’s in Durango and then returned to Redwine’s house at 2343 County Road 500, just north of Vallecito Reservoir. According to the indictment, Mark Redwine and Dylan argued during a previous visit and were not getting along leading up to the court-ordered visit. Several witnesses said Dylan did not want to visit his father, the indictment says. Text messages indicate Dylan asked to stay with a friend rather than at his father’s house the night of his arrival, but his father denied the request. Dylan made plans to visit a friend’s house at 6:30 a.m. the next day. But Dylan’s last phone activity or communication was at 9:37 p.m. Nov. 18, 2012. Dylan’s friend sent a text at 6:46 the next morning asking, “where are you,” and received no response. According to the indictment, Carrie Cochran, a neighbor, saw Mark Redwine’s exterior front porch light on at 2 a.m. Nov. 19, and later while it was still dark out, noticed the light had been turned off. The significance of the observation is not clear, but it seems to suggest someone was awake during those early morning hours. Dylan’s blood was found in multiple locations of Redwine’s living room, including on the couch, floor in front of the couch, corner of a coffee table, on the floor beneath a rug and on a love seat. It is not clear how old the blood may have been, and it is clear DNA testing will play a role in future judicial proceedings. DNA testing showed Dylan was the source of blood on the love seat, and he could not be eliminated as a contributor to the mixture found on the couch, floor in front of the couch, corner of the coffee table and beneath the rug. Redwine’s home was remodeled in March 2012 after being severely damaged by fire. According to Redwine, Dylan had limited visitations after the home was remodeled, and had not suffered an injury that caused any bleeding during visits after the remodel and before November 2012. A human-remains detection dog searched Redwine’s house Aug. 5, 2013, for the scent of a corpse. The dog, Molly, indicated the presence of cadaver scent in various locations of the home, including the living room and the washing machine. “These are indications of the presence of a large source of human remains,” according to the indictment. Also that month, Molly indicated a cadaver scent on Redwine’s clothes that he reportedly wore the night of Nov. 18, 2012. The cadaver dog also searched Redwine’s Dodge pickup and alerted to the presence of a cadaver scent in several locations, including the bed of the truck. Some of Dylan’s remains were located in June 2013 about eight miles up Middle Mountain Road, about one mile past a gate that closes seasonally starting about Nov. 30. The remains were found about 100 yards from the road, directly off an ATV trail, according to the indictment. 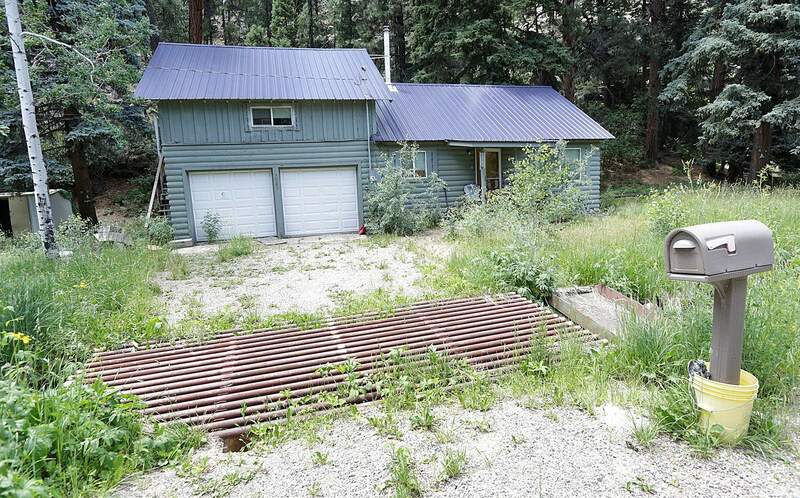 “Mark Redwine had an ATV in his garage and was very familiar with Middle Mountain Road,” the indictment says. A witness saw Redwine driving down from the gate alone in April 2013, “yet he left town and did not attend the search for Dylan Redwine in June of 2013 when the gate opened,” the indictment says. Dylan Redwine’s skull was found by hikers Nov. 1, 2015, about 1.5 miles further up Middle Mountain Road from where his earlier remains were found. The skull was found in “very difficult terrain,” but much more easily accessible by Middle Mountain Road, “consistent with a human moving it,” the indictment says. Lyle Wilmarth, a wildlife officer for the Colorado Parks and Wildlife, who has extensive experience with wildlife in the area, said no animal known in the area would transport a body up the mountain from Redwine’s home to the first recovery site let alone the additional 1½ miles through the terrain from the first recovery site to the second site. Forensic anthropologists determined Dylan’s skull had injuries consistent with blunt-force trauma at two locations. More specifically, the skull had two small markings consistent with tool marks from a knife, according to the indictment. The marks were not caused by an animal or natural circumstances, the indictment says. “These defects in Dylan’s skull were perimortem, indicating that the bone still had characteristics of wet bone similar to a recently deceased person,” the indictment says. Dylan’s half-brother, Brandon Redwine, reported having an odd conversation with Mark Redwine on June 27, 2013, immediately after Mark Redwine was notified that some of Dylan’s remains had been found. According to the indictment, Mark Redwine mentioned blunt-force trauma several times and discussed how investigators would have to find the rest of the body, including the skull, before they could determine if that was the cause.Within days of Dylan’s disappearance, but months before his remains were found, investigators interviewed Redwine’s ex-wife, Betsy Horvath. Horvath was concerned Redwine may have hurt Dylan, and said Redwine had previously said if he ever had to get rid of a body, he would leave it out in the mountains. During their divorce and custody proceedings, Redwine repeatedly told Horvath that he would “kill the kids before he let her have them,” according to her comments to investigators.About the time of Dylan’s disappearance, Mark Redwine and Elaine Hatfield Hall were in the middle of an intense custody battle over Dylan, the indictment says. Redwine told investigators he left a contempt of court accusation on the kitchen table, where Dylan may have seen it and may have become upset. Throughout 2012, Dylan said he was upset with his father, was uncomfortable with him and did not want to visit him. Earlier in the year, Dylan had seen “compromising pictures” of his father, according to the indictment. He was upset with the manner in which his father spoke about his mother and brother. Dylan asked his older brother, Cory Redwine, to send him the compromising pictures so he could confront Redwine about them. Cory Redwine later told his father he sent the pictures to Dylan. Soon after Dylan Redwine’s death was confirmed, two of Hall’s friends confronted Mark Redwine in front of his house about the pictures. 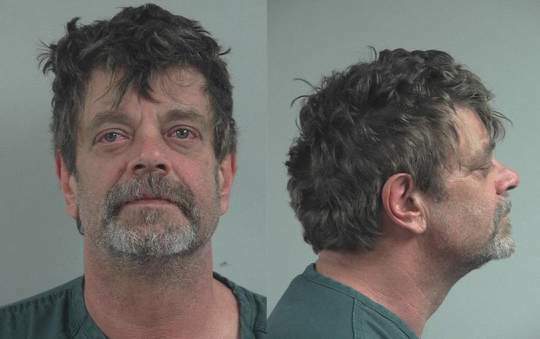 Mark Redwine picked up a log, raised it above his head in an attack gesture, and approached the two subjects, causing them to drive off, according to the indictment.